locale gastrobar - "ortigas best kept secret"
Located in City Golf along Julia Vargas Ave in Ortigas, Locale is a GastroBar that is not unfamiliar to me. It has been one of our favorite go-to nightap places for a long time now because of it's clean, cozy interiors, affordable price points and good music. But the thing is, we always go after dinner and mostly just for drinks (their craft beers are some of the best in Manila) and I never really had the chance to try their food out except for the occasional pizza and appetizer. 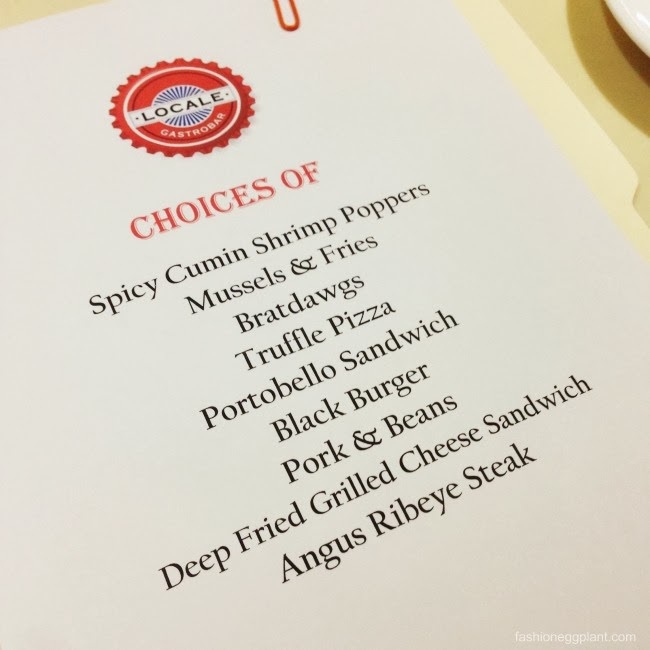 At a food tasting event held last weekend, to my surprise, I realized that Locale isn't just a pub with good beer chow, they actually take their "GastroBar" moniker to heart. Their food is superb and at par with some of our city's finest dining establishments...without the hefty price tag. Paul's favorite dish that night, serving size is generous for only 260, it comes in a tin bucket that is filled to the brim with an accompanying sour cream dip that offsets the cumin perfectly. Prawns are juicy and cooked perfectly. Mussels and Fries Php410 - new zealand blue mussels sauteed in butter, chorizo and wine with fries on the side. If you're into tapas and Spanish food, order this. The mussels they use are fresh without the odd and fishy aftertaste you usually get from local mussels. Chorizo is one of the finest I've tried with a salty and slightly tangy aftertaste which makes you come back for more. An old favorite of mine and something YOU MUST order on your first visit. Gruyere against Mozzarella is pure genius. You'd think this is too rich and a bit "nakakaumay" but it's not. The crisp thin crust and the amount of truffle paste used is at a perfect ratio. Order the big size unless you want to fight over the last piece. My absolute favorite of the night and IMHO, the best burger in Manila, a title I don't easily give out but guys, you have got to try it. I had an "Anton Ego" moment wherein I was close to tears after my first bite. It is perfection...a perfect marriage of salty, sweet and sour. It does things to you that no other burger can. It makes you want to hug it and take it home. OMG, I am salivating just thinking about it again. Grilled Portobello Sandwhich Php360 - grilled portobello mushrooms topped with torched mozzarella, cheddar, cream cheese and caramelized onions. Served with warm homemade potato chips. Generally good but I think it could benefit from a sharper cheddar. I found it a little overpowering and creamy although it's eons better when you take each bite with a large dollop of the sour cream that comes with it. Pork and Beans - couldn't find this on the menu yet so I guess it's new and definitely a great addition. I would call this the perfect Hungry Man's meal. It's big, heavy and yummy. Served with a huge slab of homemade bacon with mashed potatoes (i think) under a rich bean stew that gives a baked impression. Delish! Deep Fried Grilled Cheese Sandwhich - another new item, this I found a bit too rich for my liking but if you're into deep fried and cheese, it's a good try. It tastes like a cross between a croque monsieur and french toast probably due to the cinammon like aftertaste + bread combo. Large enough to satisfy a big appetite or good to share for 2. What I love most about this aside from its great flavor is that it's already served with rice AND mashed potatoes. I am super pinoy in the sense that I cannot have a good dinner without rice. I usually always have to pay extra and order and additional serving of rice when I feel like having steak and Locale is one of the few places I know that serve both at the same time. God bless them. Locale's Angus steak is a big bargain. Wherelse can you order steak of this size and quality for under a thousand? When you're looking for places to eat in the Ortigas area, look no further than Locale Gastrobar. It's more than just a watering hole, it's a dining destination.